Andre Holland’s performance is strong, High Flying Bird could be a launch pad for him to continue as a leading man. Steven Soderbergh has an Oscar for Traffic. However, has he ever had this much obvious fun making a movie before? Tarell Alvin McCraney’s script is insightful, powerful, and brought to life by a terrific ensemble cast. 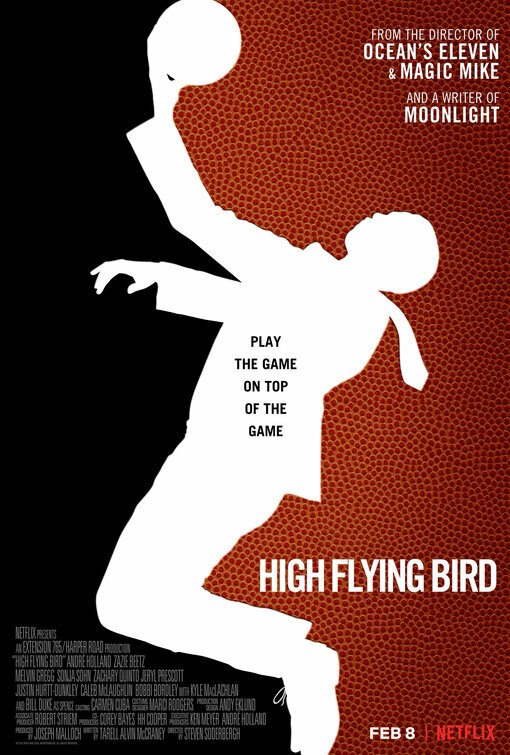 If you are not a fan of the NBA, or sports, High Flying Bird can become a bit cumbersome to sit through. Shot on an iPhone, the camera angles and overall look and feel of the film could prove a bit distracting for less discerning and/or patient viewers. Some will dismiss this as preachy, pushing an agenda, and wonder how a movie about basketball can have no real basketball scenes within the movie. Steven Soderbergh’s High Flying Bird, drawing inspiration from the 1963 folk-rock song of the same name, comes roaring out of the gate with André Holland (Moonlight) commanding the screen as Ray Burke, a sports agent whose world is about to be flipped upside down. We open with Ray mentoring NBA superstar rookie Erick Scott (Melvin Gregg) on fiscal responsibility in a fancy restaurant. Scott has yet to be paid because the league is in the sixth month of an NBA lockout, and Ray sees the chance to inform and guide his young client. However, moments later, his company credit card declines. And upon returning to his office, Ray is told that a substantial decline in company resources means he is being let go. Serving as the second consecutive Soderbergh feature to be completely shot on an iPhone, following 2018’s Unsane (this time a basic “7” reportedly does the trick), High Flying Bird is fascinating to watch, especially when it comes to aesthetics. Then, when you add in the razor sharp, occasionally dense, but whip-smart dialogue written by Oscar-winning screenwriter Tarell Alvin McCraney (Moonlight), we have all the tools we need to disappear into a movie for 90 minutes or so. McCraney’s words feel rhythmic, with Soderbergh crafting an efficiently paced drama that digs pretty deep on the concept of an NBA work stoppage, or lockout, and the ripple effect that has on the owners and players alike. More than just snappy words uttered out loud, High Flying Bird finds Ray re-evaluating a world he is trying to survive in. Prized rookie Erick Scott (Melvin Gregg) has stayed with his agent, and you feel Ray desperately trying to hang on, while wondering if there’s a way out of a business he grows increasingly dissatisfied with. With the lockout nearing half a year, Ray is wheeling and dealing, largely because, as an agent without an agency, he has no other options professionally than to try and end the lockout. His long-standing friendship with Players Association representative, Myra (Sonja Sohn), bears little fruit, as she struggles to make headway with the owner of Scott’s NBA team (Kyle MacLachlan). Holland’s performance is terrific. He begins cocky, fast-talking, a deal maker. McCraney’s screenplay breaks Ray down bit, with Holland portraying a man suddenly standing at the crossroads masterfully well. Perhaps my favorite scene comes near the middle of the film. Ray is frustrated that Scott, and his friend and former assistant Sam (Zazie Beetz), are late arriving at a basketball charity camp Q & A, hosted by former NBA player and father figure of sorts to Ray, Spence (Bill Duke). Spence forces Ray to fill time, and hesitantly, he tells the story of his cousin, equals on the court growing up, who grew to a height of 6-feet 6-inches tall over the course of a year. When Scott finally does arrive, Ray holds the mic close a little longer, working through his story and realizing some truths within himself. Ray pivots. The vulnerability changes him. And it dawns on him that the game he loved passed him by. Under the backdrop of a lockout, fierce negotiations going nowhere, an increasingly frustrated client and no job, Ray realizes basketball burned him again. The way High Flying Bird is shot, edited, and presented, Soderbergh looks like he’s having the time of his life making movies on an iPhone. He plays with angles, lighting techniques, and feels like he is pushing the limits of what his little smartphone can do. Picked up by Netflix, with a small theatrical run in February 2019, ironically, many people will be watching a movie shot on an iPhone 7 on their own iPhones. Yet there is nothing amateurish about any of this. While McCraney’s film can get a little dense when it comes to topics of basketball, the NBA, and player/owner negotiations, anyone with a passing interest in a character-driven sports drama should give this a look. At times, it is incendiary, in other moments coy and playful. However, when it explores the player as commodity, those moments hit pretty hard. With André Holland’s great turn, terrific supporting performances, and Soderbergh loose and having fun, High Flying Bird is a standout from the first few weeks of the 2019 movie year. Starring: André Holland, Zazie Beetz, Melvin Gregg, Sonja Sohn, Bill Duke, Kyle MacLachlan, Zachary Quinto, Justin Hurtt-Dunkley.